Johannes Vermeer works are classified as ‘genre’ paintings and not still life; however, numerous of his works contain arrangements of inanimate objects similar of those still life painters of the Golden Age. 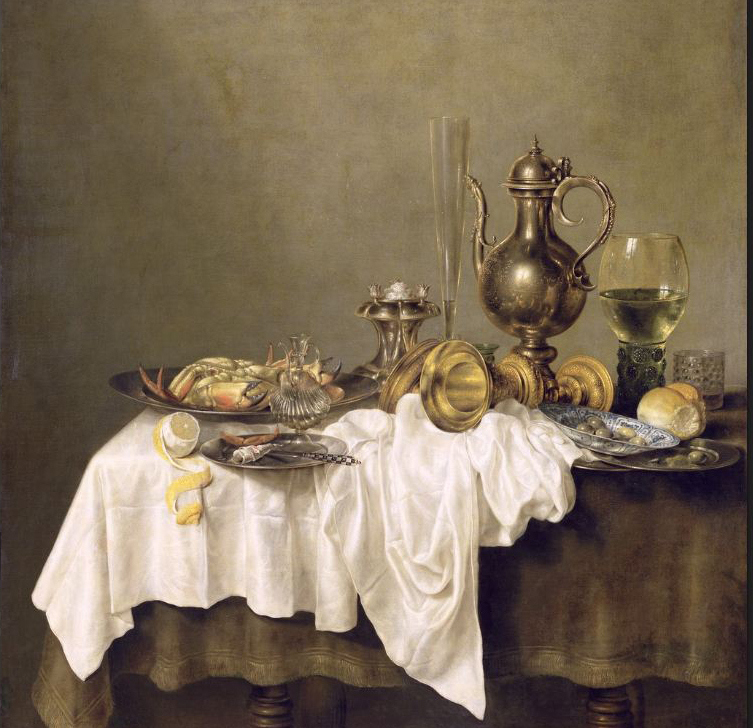 See the images at below, most striking the one at left, a detail from “The Girl with a Glass of Wine” c. 1659-1660 where the arrangement of the white table cloth seems to come straight from a Willem Claesz Heda painting like “Breakfast (Ontbijt) with crab”. 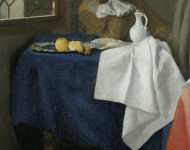 I highly doubt that Heda's or Vermeer's painting is representing the way a normal table cloth would be set up, folded so carefully to cover just the corner. Still Life paintings were very popular, so the question is; why is that Vermeer did not painted any although he kept including small arrangements in his paintings?. For one thing, still life paintings of the time were a lot more work than genre paintings. They included difficult textures and the details in the glassware, jewelry and rich objects required lots of work. Vermeer was already a very slow painter, about one or two paintings per year and unlike all other masters, Vermeer did not take apprentices. His strokes were a lot coarser; they could easily be seen when examined closely. Therefore, it would have been a lot more time consuming to adopt Pieter Claesz, Heda or Bosschaert styles where you can’t see the brush strokes and the level of detail is almost photographic. But I am digressing, the fact remains that Vermeer was not a still life painter. I always wondered what a still life made by Vermeer would look like. This is the premise of some of my recent works that I call “my Vermeers”. 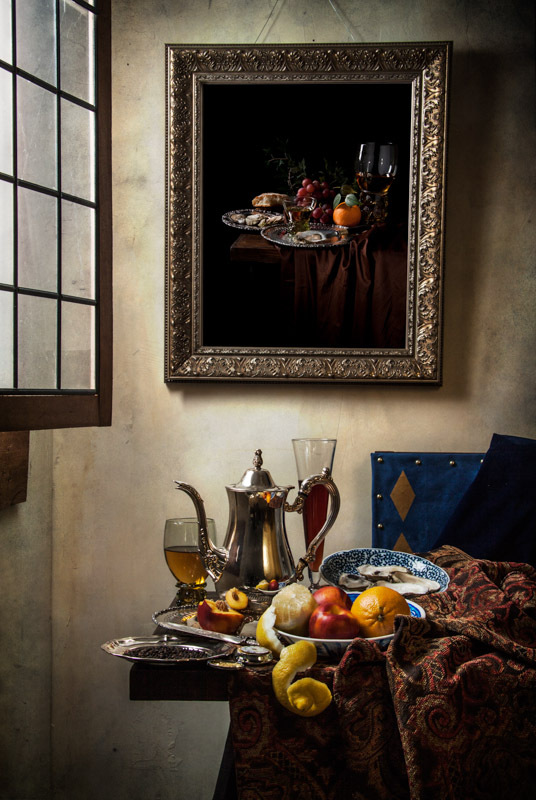 I decided to compose image that had recognizable characteristics from Vermeer paintings while being JUST a still life. The first effort went to “Girl Reading a Letter at an open Window”. I needed enough objects to create a credible parallel of Vermeer works without the girl. The most difficult being the “Spanish” chair in the background, these chairs appear profusely in Vermeer and Peter de Hooch paintings. I ended up building one later, after this image was shot (you can see it in the photo at right). This makes me feel sometimes like I should it shoot again. Then, I start asking why is the girl not there? I then, created a story that uses facts from the XVII century United Provinces (today’s Netherlands and Belgium) but keeping the story around simple matters that will be appropriate for a genre painting. So, this is how I managed in my own way to blend both styles, the image is a still life while the story is closer to a genre painting.